At Aesthetic & Dermatology Center, we offer you a variety of facials that are optimized to help you reach your aesthetic goals and give you the youthful appearance you’ve been wanting. During a consultation with your aesthetician at Aesthetic & Dermatology Center, you will discuss your cosmetic and aesthetic goals in order to determine which type of facial and what series of products is appropriate for you–our facials are even great for pregnant and nursing mommies! Are you ready to be pampered? The Fire and Ice facial is an intensive clinical facial that is designed to resurface the skin. This facial is a two-step process that includes a powerful resurfacing masque and a soothing rejuvenating masque. Why is it Called “Fire and Ice”? This facial is so effective because of its two-part stimulating and cooling effect. 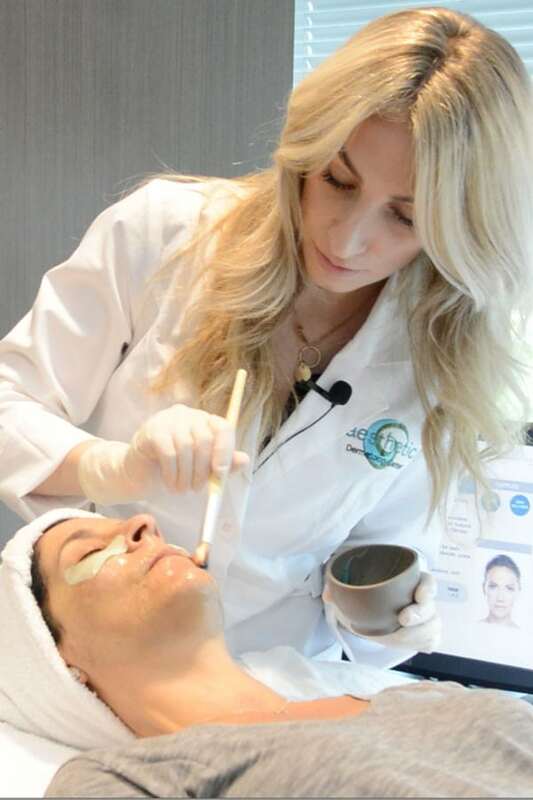 At Aesthetic & Dermatology Center, we utilize the Intensive Resurfacing Masque to stimulate blood flow and exfoliate your skin, rapidly reducing the appearance of fine lines and wrinkles. The cooling mask we use is the Rejuvenating Masque to intensely nourish and replenish your skin with hydration and antioxidants. Additionally, we complement this facial with various creams and serums to give you the best, most vibrant appearance. This facial is specifically designed to awaken your senses, utilizing aromas of warm cinnamon and brisk peppermint. Our aesthetics services at Aesthetic & Dermatology Center are optimized for you and your skin type. Our team is devoted to ensuring you receive the high-quality, individualized treatment that you deserve. Your provider will specifically tailor your treatment to you in order to best meet your aesthetic goals. When your daily skin care routine falls short and your skin needs an extra boost, our aesthetician services at Aesthetic & Dermatology Center can help give you the vibrant, youthful appearance you’ve been wanting. Visit Rockville’s leading dermatology center to learn more about how you can reach your aesthetic goals. To find out what kind of facial is best for you, call our office today at (301) 610-0663 to schedule your appointment or request an appointment online.